A leaked report allegedly produced by the Tunisian Commission for Financial Analysis (CTAF) reveals an investigation into a prominent leader of Islamic Relief – the international Islamist charitable network founded in the U.K. and named by the United Arab Emirates as a terrorist organization – over concerns that monies given to Islamic Relief's Tunisian branch by the British parent branch, Islamic Relief Worldwide, were used to fund jihadists at the Tunisian-Libyan border. According to the report, CTAF (which is tasked with tackling money laundering and terror finance) found that Islamic Relief Tunisia's chief bank account was found to have received a total of almost $2.5 million from Islamic Relief Worldwide as well as a prominent New York financial services firm, INTL FCStone. From this income, the report claims that over $50,000 was spent just a few miles from the Libyan border – a jihadist hot-spot – on car rentals and purchases, hotels, fuel, and cell phones. CTAF has reportedly concluded that these expenditures provided "logistical support" for jihadists preparing to enter Libya. CTAF also reportedly studied the bank accounts of the former Director of Islamic Relief Tunisia, Abdelmonem Daymi, his wife Hager Abdelouahed, and his brother Mounir Daymi. Investigators found that one of Abdelmonem Daymi and his wife's joint accounts had received repeated large transfers totaling $150,000, in many different currencies, from sources in the U.K, U.S, and Qatar. Daymi is a long-standing employee of Islamic Relief. At various points, he has held senior positions in Islamic Relief Worldwide (the UK parent branch), Islamic Relief Canada and Islamic Relief Tunisia. Today, Daymi directs Islamic Relief's operations in Lebanon. Despite having left Islamic Relief Tunisia in 2015, CTAF investigators reportedly concluded that Daymi retained control over Islamic Relief Tunisia's bank accounts. Daymi is also the founder and former director of the Tunisia Charity, which serves as an arm of the Qatar Charity, which itself is funded and controlled by the Qatari regime. 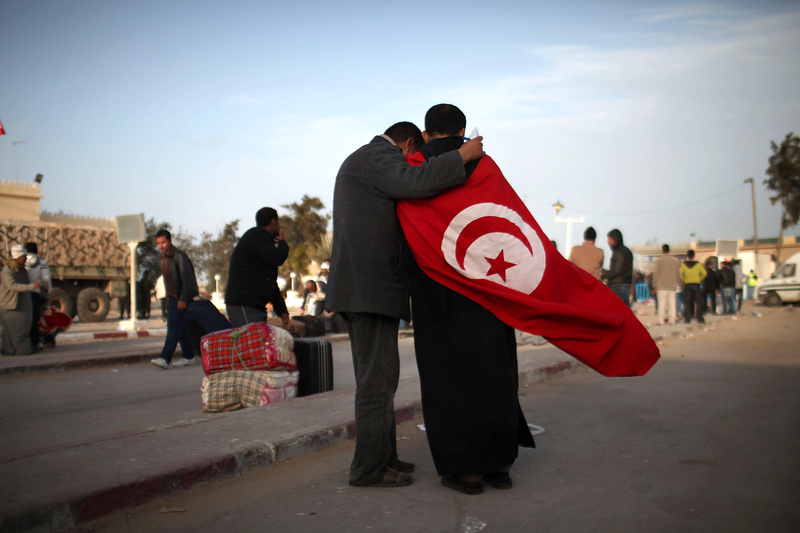 According to Tunisian media, Tunisia Charity was one of three organizations in Tunisia given access to $7.5 million of funding by the Qatari regime. In 2017, Tunisian lawmakers accused the Tunisia Charity of funding terrorism and called for an investigation. Although Daymi resigned as director of Tunisia Charity in 2014, his wife, Hager Abdelouahed, remains an employee of the Qatari-controlled charity. Abdelmonem's brother Mounir Daymi, meanwhile, is a director of Al Jazeera, Qatar's enormous regime-controlled international media network. Abdelmonem Daymi's other brother, meanwhile, is Imed Daymi, one of the country's most prominent politicians. He recently served in a coalition government with the Islamist Ennahda Party – a branch of the Muslim Brotherhood. Although he leads a separate political party (Congress for the Republic), Daymi is described in Arabic media as an "ally of Ennahda." In 2013, Daymi flew to Qatar with Rachid Ghannouchi, co-founder of Ennahda and one of the world's leading Islamist thinkers, to meet with the Qatari Emir. Following media furor over the allegations against Islamic Relief and the Daymi family, Imed Daymi and other Islamist politicians condemned the allegations as conspiracy theories. CTAF has since denied publishing or leaking any information about the investigation, but it has pointedly refused to deny that the report exists, only stating that it hands its findings "exclusively to the Public Prosecutor's office." Despite receiving over $80 million from Western taxpayers over the past decade, a growing number of governments and financial institutions have accused the Islamic Relief franchise of involvement with Islamist extremism and terror. In 2014, the United Arab Emirates designated Islamic Relief Worldwide as a terrorist organization; in 2016, the banking giant HSBC shut down Islamic Relief's accounts, following a similar decision made by UBS four years earlier; that same year, German and Swedish governments named Islamic Relief as a proxy for the Muslim Brotherhood; and in 2017, the Bangladeshi government banned Islamic Relieffrom working with Rohingya refugees over reported radicalization fears. In 2018, the Middle East Forum published a comprehensive report uncovering new evidencelinking Islamic Relief to charitable associations controlled by the Palestinian terrorist movement Hamas, and revealing that Islamic Relief's U.S. branch had been the subject of a secret federal investigation in the United States. Members of Congress have since launched an inquiry into the details of this investigation. And in Egypt, state prosecutors have argued, in the re-trial of leading figures in the deposed Morsi government, that the short-lived Muslim Brotherhood regime used Islamic Relief to fund Islamist groups in Egypt as well as foreign terrorist organizations, using funds from international Islamic Relief branches and the Qatar Charity. One of Morsi's co-defendants and his former senior advisor, Essam El-Haddad, is the co-founder of Islamic Relief. Now that Tunisian investigators are homing in on the activities of Muslim Brotherhood-linked, Qatar-backed charitable organizations in North Africa, it looks increasingly likely that supervising Islamic Relief officials in London and D.C. will also have to deal with questions of their own, in the face of growing concern from Western policymakers, law enforcement, and the taxpayers. Sam Westrop is Director of Islamist Watch, a project of the Middle East Forum. Martha Lee is a writer for Islamist Watch.